Follow BEETNIK Recipes on twitter! 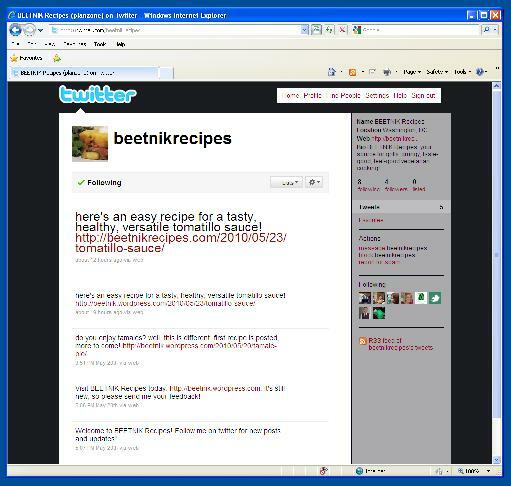 Just to make things a little easier for you, you can now follow BEETNIK Recipes on twitter! All new posts will be tweeted immediately (yes, even this post about being on twitter!). You can still subscribe to this blog or use an RSS feed with the links in the bottom right of this page. Then just come on back periodically to see what’s new! Welcome to BEETNIK Recipes, your source for gritty, grungy, taste-good, feel-good vegetarian cooking! BEET is a modern vegetarian philosophy and lifestyle. At it’s core is the same fundamental philosophy of the Beat movement: bettering ones inner self above superficial and materialistic matters. To learn more about this website, check out About BEETNIK Recipes.